The postcard collection was started by Bill and Judy Lynch over 30 years ago. Both daughter, Tracie and granddaughter, Halie have been active participants as well. 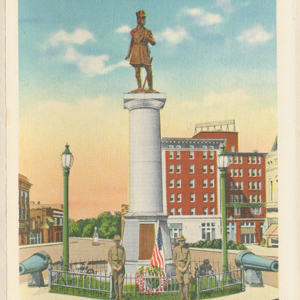 The collection is being shared with the Spartanburg County Public Libraries, to allow anyone with an interest in Spartanburg’s history access to these postcard images. In its entirety the collection has approximately 1,200 postcards. Most of the postcards and the images associated with them were published during the 20th century (1900-1999). A small portion predate that time period. Included in the William Lynch Postcard Collection are images by several photographers and artists. The scope of the collection is very broad including images of local churches, textile mills, hotels, and schools. It also reflects the cultural heritage and industry of the area with images of various individuals, store owners, and laborers. Spartanburg once was a center for military support with both Camp Wadsworth (WWI) and Camp Croft (WWII) and this collection contains photos from both of these military camps. Probably the most endearing characteristic of this postcard collection is the handwritten personal messages found on many of the postcards. This provides a glimpse to life and culture during the time the messages were composed. Some messages are funny, some are sweet, and some are quite sad, but all give an incredibly personal look at the spectrum of societal pressures and hardships, the various educational levels achieved by the writers, and their overall general impressions of the Spartanburg area.